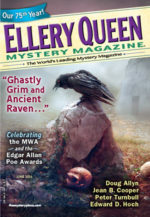 “Johnny Depp Kickline of Doom” appears in the June 2016 issue of Ellery Queen Mystery Magazine. There really was a Johnny Depp kickline at Comic Con–not so much a murder! Based loosely on my husband’s many years attending Comic Con, the story celebrates the many wonderful characters I met as I helped Dale at over a decade’s worth of shows. This was my first short story paycheck. This magazine is edited by Janet Hutchings. 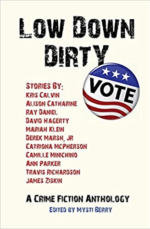 I edited and published Low Down Dirty Vote, a collection of crime fiction. Eleven talented authors broke out of their comfort zones and produced varied and fascinating stories around the theme “fighting voter suppression.” 100% of sales contributed to the ACLU Foundation and earmarked to help them fight voter suppression. We raised $5,000 and created unique crime fiction in nearly every voice, tone, and sub-genre from noir to humorous. You can buy this book from all the regular outlets, and we’ll keep donating the sales until voter suppression is defeated. 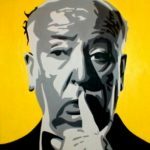 Around September 2019, my new short story will be in Alfred Hitchcock Mystery Magazine. It’s my first in this fabulous magazine edited by Linda Landrigan. Finally, I just sold another story–details when I’m allowed to say! “Inside Job” in the second Guppies anthology Fish Nets (Sisters in Crime chapter of pre-published writers) published in 2013. The Guppies chapter is incredibly supportive of writers and I recommend it to anyone who needs a community of writers. “Something Shiny” in Switchback Issue 4, 2005, the University of San Francisco MFA in Writing program’s literary magazine. It was an experiment in form and works best when read aloud. This story was also published in he San Francisco Writer’s Conference first anthology, Building Bridges from Readers to Writers in 2006. An excerpt from novel Daughter of the Wind was published in the 2005 Todd Point Review, a collection of winning entries from the Mendocino Coast Writers Conference contest.